Donald Trump is getting smoked in the polls right now because he has run the most inept campaign in the history of campaigns. 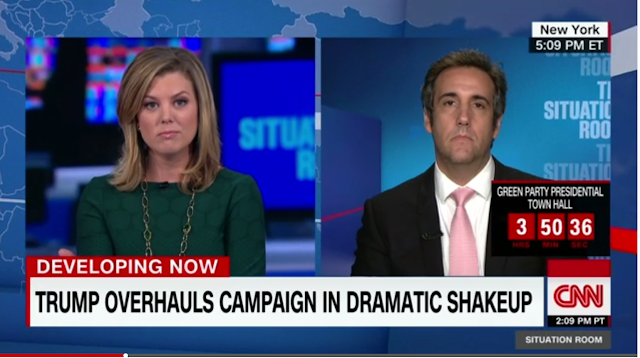 So with that being the state of the race on Wednesday, the 17th of August in the year of our Lord 2016, Michael Cohen, one of Donald Trump's top advisers (and unbelievably his lawyer,) went on CNN to try to pedal that Trump is gonna win. Brianna Keilar was pinch hitting for Wolf Blitzer in the situation, and thank God she was! She asked Cohen about why polls that say the exact opposite. Cohen was about that. Watch what happens when his denial meets the unmovable object of reality. This is probably the best exchange putting a Trumper in check we've seen in a long time! Next time we don't like what someone is saying to us we're just gonna yell "Say's who?" over and over and see how it goes.